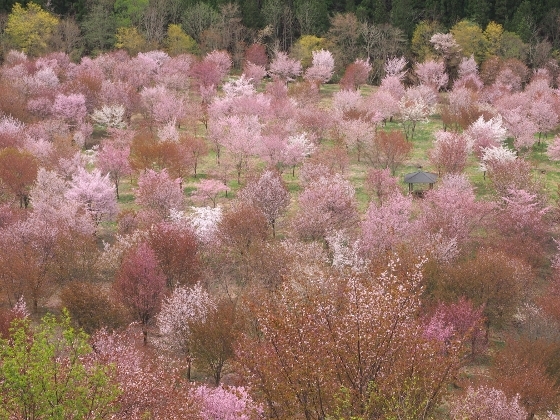 Thousands of cherry trees bloomed all at once in late April, at Sakuratoge slope, Kitashiobara. Photo above was a fantastic view this morning, when I visited the site. 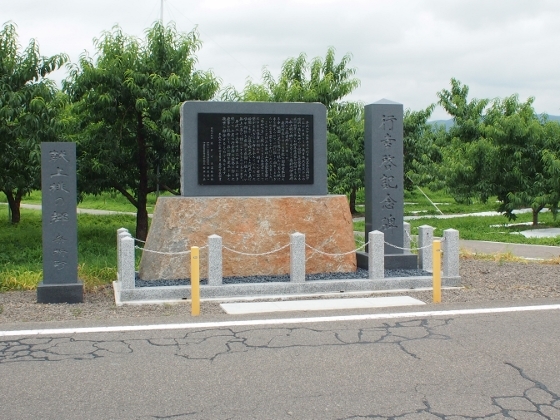 A brief description of Sakuratoge shown above was found at the site. 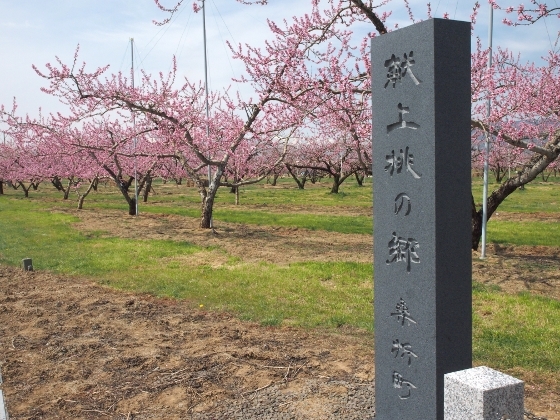 It said 2001 cherry trees were planted by local volunteers commemorating the birth of their first daughter between Crown Prince and Princess in the year 2001. 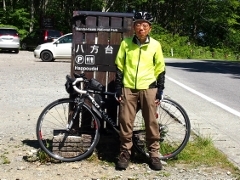 They had often visited Kitashiobara for rest and refreshment. Another view with a passage in front is shown above. 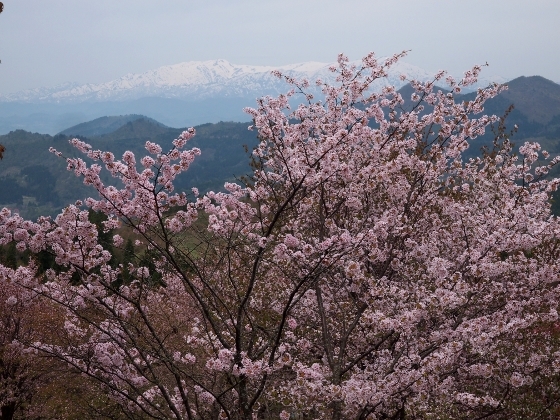 Snow-capped Ide Mountain range was seen far away in a cloudy sky beyond cherry blossoms as shown above. 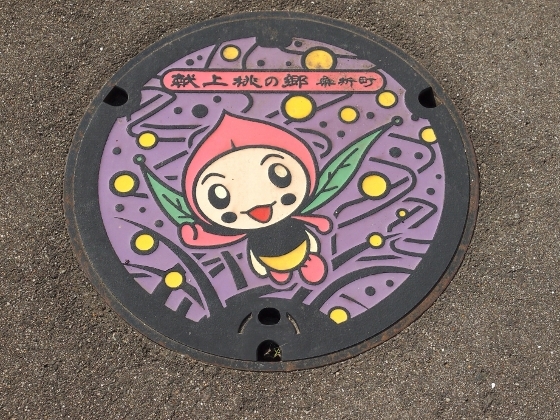 Some spring flowers were found on the ground as shown below. 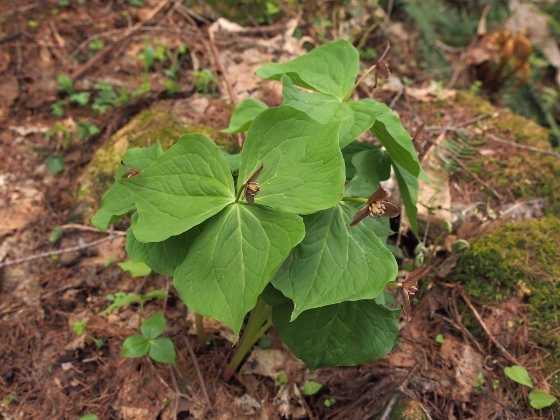 Trillium Apetalon or Enreiso with large leaves was found as shown above. 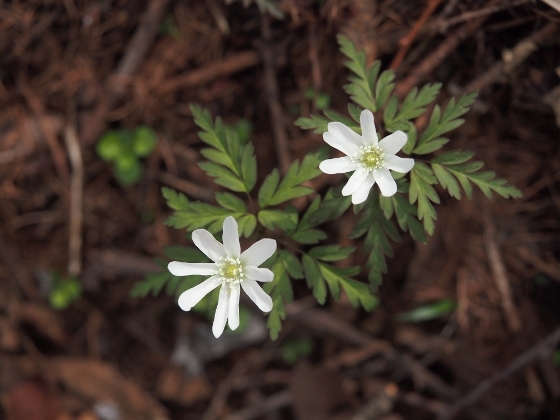 Flowers of Anemone pseudoaltaica were found here and there as shown above. 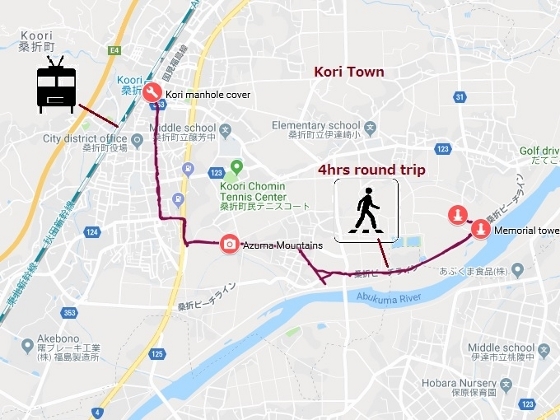 I took a local bus (Toto Bus) from JR Kitakata Station to get to Sakuratoge. 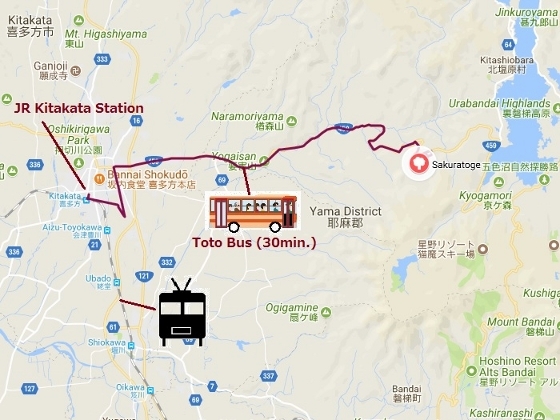 The bus stop is called Raviespa Urabandai and it took about 30 minutes. 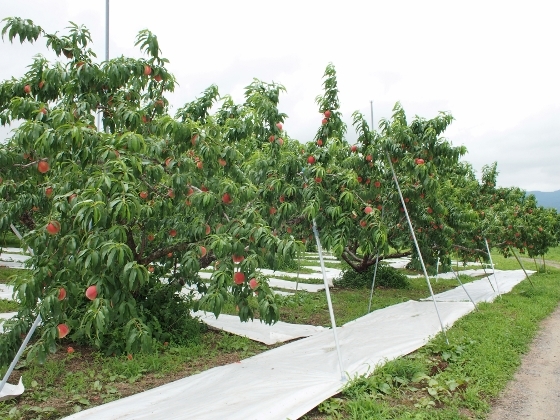 Today I visited Kori Town which was a home to peaches offered to Imperial Family. 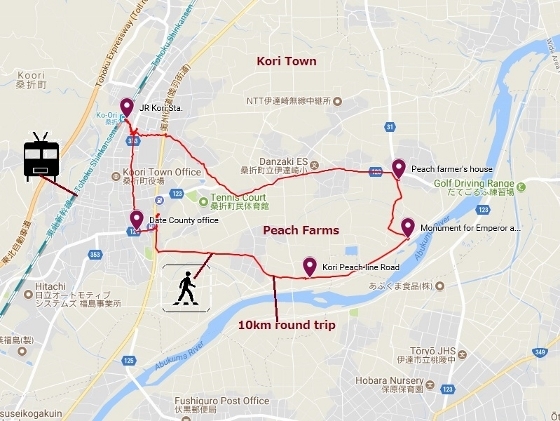 I walked around the vast peach farmland area which stretched along Kori Peach-line Road in the eastern part of the town. 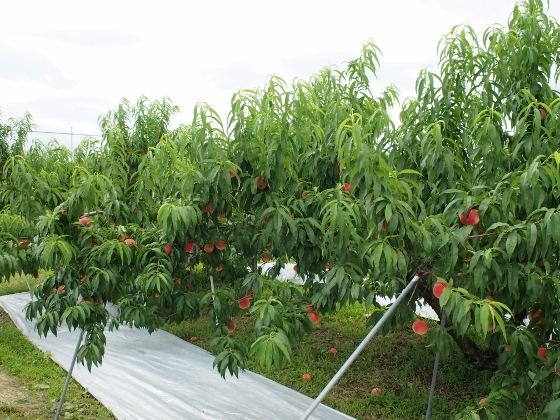 A popular variety called “Akatsuki” was in its high season of harvesting as shown above and it continues through the end of early August. 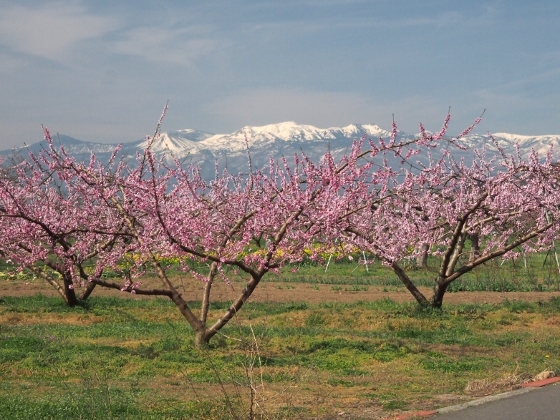 Every recent year in this time of the season, peaches are harvested at these farms, and then screened, selected carefully and offered to the Imperial Family. 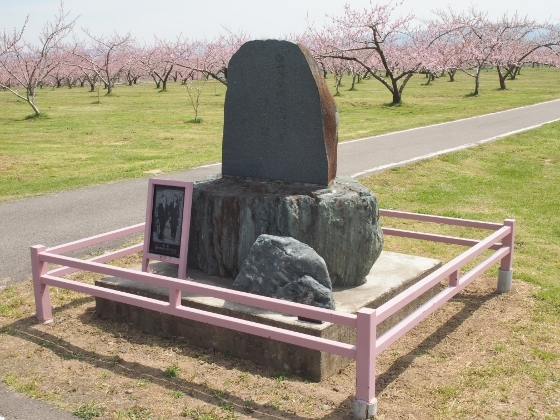 Once I stepped out of JR Kori Station which was located near the center of the town, I found a stone pillar standing in front, which was inscribed as “home to peaches for Imperial Family” as shown above. 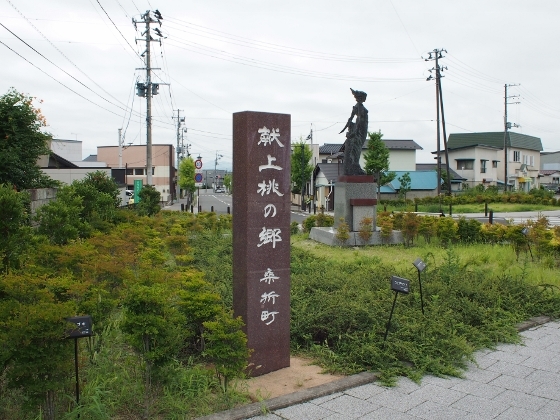 The town prospered during Edo Period as a post town on old Oshu Highway and after Meiji Restoration in 1867, a local administrative office for Date County was placed here. 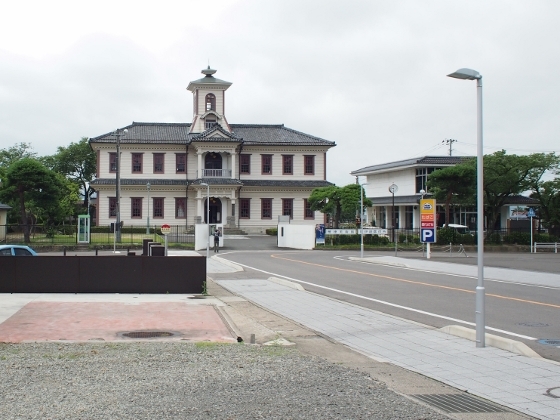 The old office building, which was built in 1883 are being preserved in the town center as shown above. 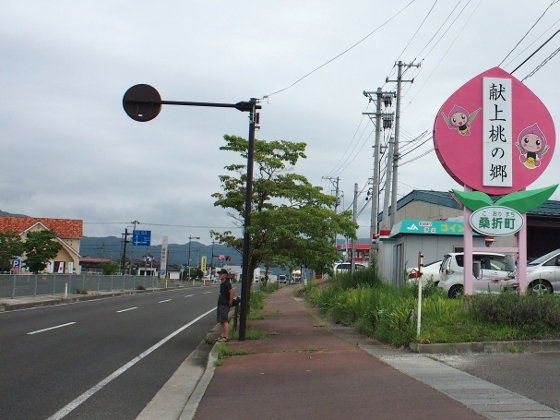 Moving to the east I crossed a major National Route 4, where I found another sign of “home to peaches for Imperial Family” on the roadside in front of JA market as shown above. 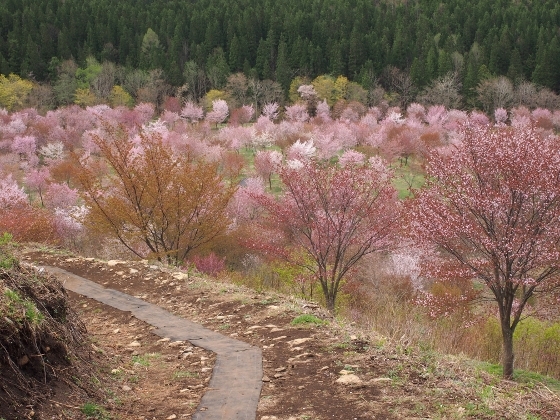 Shortly after, I was walking along the Kori Peach-line Road, where peach farms such as shown above continue during a long walk. 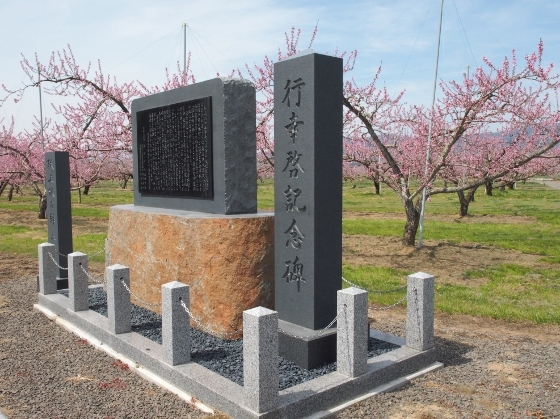 Then I came to a monument as shown above, which commemorated 1st and 2nd visits by Emperor and Empress in 2013 and 2015, when the two encouraged local farmers toward the recovery from the Great East Japan earthquake and nuclear accident disasters. 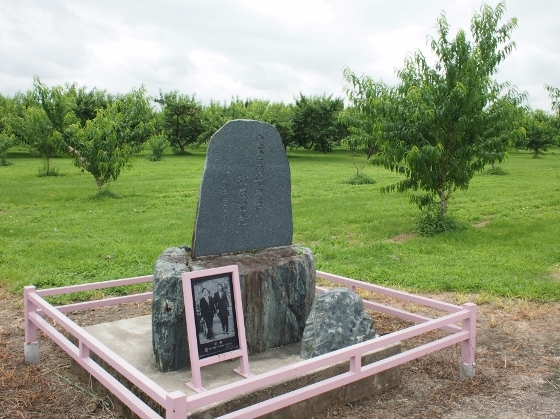 Next I came to another monument in a corner of the farmland as shown above, which commemorated a visit by crown prince and princess in 1996. 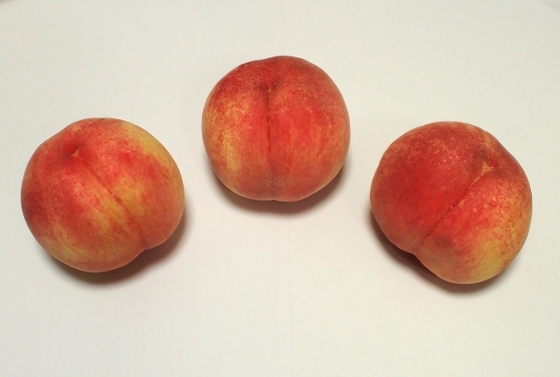 I finally visited one of farmers in the area, tasted a peach harvested, which was excellent and juicy. 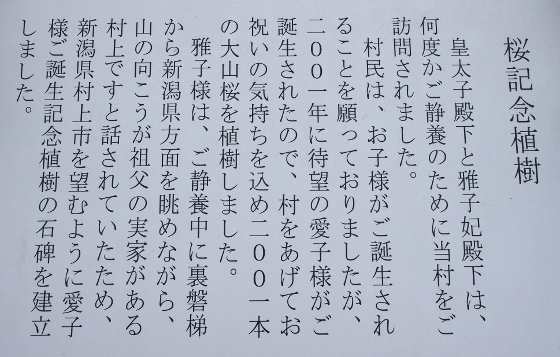 I ordered some boxes for family members and relatives who live outside Fukushima. The samples are shown above.